NOTES: WHAT IS THE ADDRESS? Notes to Poem: What Is the Address? Preface: Robert Bly gave a Stanford Poetry Colloquium on May 20, 2008. His reading of Tomas Tranströmer's "The Scattered Congregation" (1973) inspired this poem. The image of Nicodemus the sleepwalker in his last stanza is especially thought-provoking. Not knowing the Address, he's on his way willy-nilly going nowhere. This is like most of us who don't know where we came from or where we're going. The Jewish Rabbi Nicodemus was certainly not awake when he came by night to see Jesus, who told him that he must be born again in Spirit to enter the Kingdom of God. (Gospel of John 3.1-16). When I met Bly at his office before class on May 21, 2008, I told him that the Nicodemus story is one of my favorites in the Bible. I gave him my poem "What Nicodemus Came to Learn By Night" (1990) which he liked. What was particularly insightful to me is John 3.14 "And as Moses lifted up the serpent in the wilderness, even so must the Son of man be lifted up." Since 3.14 is the symbol for π, a transcendental number, "the Son of man must be lifted up" is telling us that we need to experience transcendence in our life on earth, striving for perfection like the circle. This theme is explored more fully in this poem using key 3.14 passages from sacred scriptures and literature. Each stanza of this poem has 3 lines with 14 syllables to reflect π = 3.14 with a total of 27 lines. This poem was read in Bly's last class (5-28-2008), with Notes completed on 6-16-2008. There was a man of the Pharisees, named Nicodemus, a ruler of the Jews: The same came to Jesus by night, and said unto him, Rabbi, we know that thou art a teacher come from God: for no man can do these miracles that thou doest, except God be with him. Jesus answered and said unto him, Verily, verily, I say unto thee, Except a man be born again, he cannot see the kingdom of God. Nicodemus saith unto him, How can a man be born when he is old? can he enter the second time into his mother's womb, and be born? Jesus answered, Verily, verily, I say unto thee, Except a man be born of water and of the Spirit, he cannot enter into the kingdom of God. That which is born of the flesh is flesh; and that which is born of the Spirit is spirit. Marvel not that I said unto thee, Ye must be born again. The wind bloweth where it listeth, and thou hearest the sound thereof, but canst not tell whence it cometh, and whither it goeth: so is every one that is born of the Spirit. Nicodemus answered and said unto him, How can these things be? Jesus answered and said unto him, Art thou a master of Israel, and knowest not these things? Verily, verily, I say unto thee, We speak that we do know, and testify that we have seen; and ye receive not our witness. If I have told you earthly things, and ye believe not, how shall ye believe, if I tell you of heavenly things? And no man hath ascended up to heaven, but he that came down from heaven, even the Son of man which is in heaven. And as Moses lifted up the serpent in the wilderness, even so must the Son of man be lifted up: That whosoever believeth in him should not perish, but have eternal life. For God so loved the world, that he gave his only begotten Son, that whosoever believeth in him should not perish, but have everlasting life. On 4-4-1987, I was reading the Nicodemus story in my Bible at home in Palo Alto, when I noticed "Moses lifted up the serpent in the wilderness, even so must the Son of man be lifted up" occurs at John 3.14 the symbol for π = 3.14, a transcendental number. I looked up Genesis 3.14 and found God punishing the serpent to crawl on its belly. So when Moses lifted up the serpent, he performed a transformation from the horizontal flow of time to the vertical ascent to eternity "Son of man be lifted up" (Christ on the Cross). 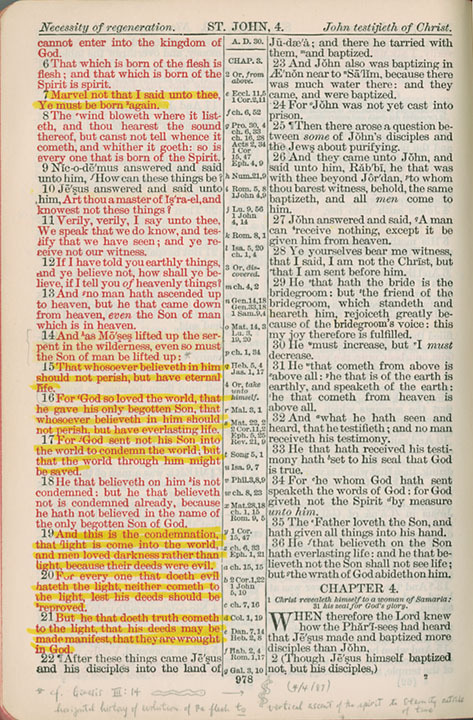 I wrote in the my Bible's marginalia on p. 978: "cf. Genesis 3.14 horizontal history of evolution of the flesh to John 3.14 vertical ascent of the spirit to Eternity outside of time" and drawing an earlier version of the Caduceus the Rod of Asclepius with a single snake rising (symbol of kundalini). Exactly three years later on 4-4-1990, while looking at a postcard of Vasarely's painting of Vega, it reminded me of John 3.14 which inspired the poem "What Nicodemus Came to Learn By Night". Ask Giotto he knows! Einstein will also show the way there. Giotto di Bondone (1267-1337) was a Florentine painter, sculptor, and architect. He broke away from the Byzantine style by adding vibrant colors and dimensionality to his paintings. Giotto's masterpiece is his frescoes at Padua's Scrovegni Chapel (1305). 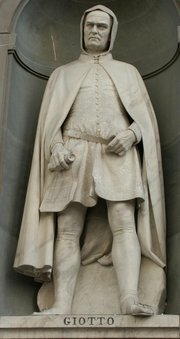 In Vasari's Lives of the Most Excellent Painters, Sculptors, and Architects (1550), we find this interesting story about Giotto: "A courtier from Pope Benedict IX told Giotto that the Pope wanted to make use of his services and asked him for a drawing which he could send to his holiness. At this Giotto took a sheet of paper and a brush dipped in red, closed his arm to his side, and with a twist of his hand drew such a perfect circle that it was a marvel to see. Then, with a smile, he said to the courtier: "There's your drawing." As if he were being ridiculed, the courtier replied: "Is this the only drawing I'm to have?" Giotto answered, "It's more than enough. Send it along and you'll see whether it's understood or not." Because Giotto could draw a perfect circle freehand, I consider him a knower of π, the address of the transcendent. 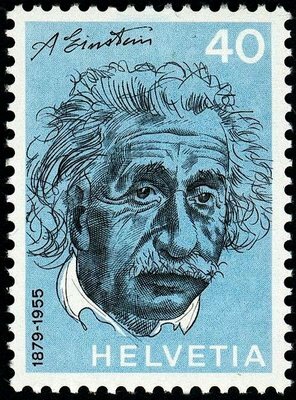 Albert Einstein was born in Ulm, Germany, on March 14, 1879. If we arranged his birthday as 3-14-1879 or 3.141879, it resembles π the transcendental number 3.1416 used to compute the circumference and area of the circle. In fact it's accurate to 0.009%. No wonder Einstein's mind was so much in peace and harmony with the universe! Beside appearing as a numerical value in Einstein's birthdate, π is also found in the Einstein field equations (EFE) in his theory of general relativity in which the fundamental force of gravitation is described as a curvature space-time caused by matter and energy (1915): Gab = 8πTab, where Gab is the Einstein tensor and Tab, the stress-energy tensor. π also appears in the cosmological constant (Greek capital letter lambda Λ) proposed by Einstein (1917) as a modification of his original theory of general relativity to achieve a stationary universe: Λ = 8πρvac, where ρvac is the intrinsic energy density of the vacuum. Note: Georg Philipp Telemann, a German Baroque composer, is the most prolific composer of all time with more than 3000 compositions credited to him. He was born on March 14, 1681 and died June 25, 1767. If we take Telemann's birthday 3-14-1681 and convert it to 3.141681 and compare it to π = 3.1416, they differ only by 0.000081 or 0.0026%. This is even closer than Einstein's birthday comparison to π. However, I prefer Einstein's cosmic vision of E=mc2 and his field equations to be as transcendental as Telemann's music, and have linked him with Giotto's perfect circle in this poem. The Serpent can't forget. Moses will remember this place. The Red Fountain at Stanford Green Library knows the secret. The Red Fountain to the left of the main entrance to Stanford Green Library is a gift of Forrest & Patsy Shumway, Class of 1950. From the air, the nearly circular fountain appears as a Sacred Hoop. When facing Green Library, it resembles the Greek letter pi (π) and mathematical symbol π = 3.1416... which is a transcendental number associated with the circumference of the circle π and its area (πr2). There are always dozens of bicycles near the fountain as students park them there while going to the library. Some students like to study around the fountain, perhaps the sound of the water from its nozzles soothes and relaxes them. The above photo was taken after requesting students to move so I could get an unobstructed view of the Red Fountain. While taking this photo, I noticed the 14 rings for the first time. I tell myself "Isn't it poetic to have a sonnet singing in the rain" before realizing that 14 is also the first two digits of π = 3.14 after the decimal point. Then I asked "Where is the 3? " and had my aha moment when the three bold strokes of red appeared before me. 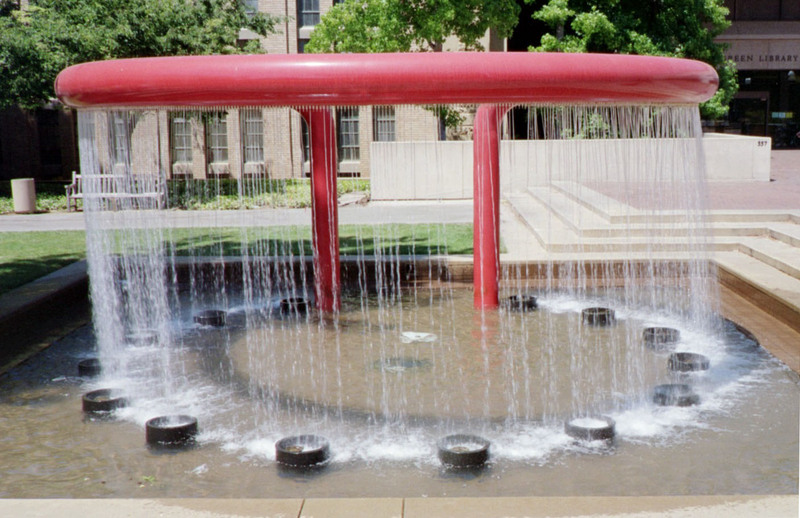 So from now on, I'll just call it the "π Fountain" a transcendental Torii Gateway to sacred wisdom in the Green Library. Robert Bly is right when telling his class to write prose poems in honor of an object "If you're attentive, the object will reveal its secret to you." When you find this home it is better than silver or gold. This gem of a home is none other than wisdom (Proverbs 3.13: "Happy is the man that finds wisdom, and the man that gets understanding. ") Proverbs 3.14: "For the merchandise of it is better than the merchandise of silver, and the gain thereof than fine gold." Sacrifice is sacred action Bring the rain for our food. Bhagavad Gita 3.14: "Food is the life of all beings, and all food comes from rain above. Sacrifice brings the rain from heaven, and sacrifice is sacred action." The idea that the rain from above (heaven) nourishes the earth below, and provide food to give us life has a circularity theme, so I was surprised it is located at the 3.14 sign of π in the sacred text of the Bhagavad Gita, the most popular scripture of India. While ascending, he looked up and saw the white pearls gleaming. the symbol for π associated with the circle. Emerson opens his essay on "Circles" (1841) with the eye: "The eye is the first circle; the horizon which it forms is the second; and throughout nature this primary figure is repeated without end. It is the highest emblem in the cipher of the world. St. Augustine described the nature of God as a circle whose centre was everywhere and its circumference nowhere." Emily Dickinson understood this well when writing to Thomas W. Higginson (Letter #268, July 2, 1862): "Perhaps you smile at me. I could not stop for that My Business is Circumference." Ask Melencolia for her compass to square the circle. 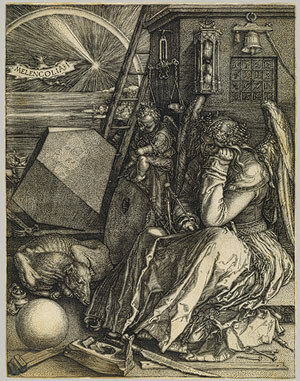 Albrecht Dürer's Melencolia I (1514) is an engraving showing the Angel of Melancholy in despair for inspiration. There is a sphere near her feet and a semi-circular rainbow at the horizon. The 4x4 Magic Square of Jupiter acts as an amulet to ward off the evil planetary influences of Saturn. Each row adds up to 34 horizontally, vertically, and diagonally. Melencolia holds a compass in her right hand. Her left hand is against her cheek pondering on the irregular polyhedron before her. She wears a wreath of watercress on her head. Her assistant putto sits on a millstone with a circular hole at its center. The dog is asleep. Various tools of the craftsman are strewn around her feet. She appears to be stuck. If you can borrow her compass and complete her task of squaring the circle, she'll be grateful for your help. In my computer graphics "Transformation" (1993), I make this attempt: "Squaring the Circle / bringing heaven to earth. / Dante has done it when / he gave us the Paradiso" (Paradiso XXXIII.135-145). After reading this poem in class (5-28-2008), Bly felt that this line "compass to square the circle" was too intellectual and suggested "Ask Melencolia to weep." Perhaps tears would alleviate this angel's sadness. When I noticed the bell above her head, it reminded me of Emily Dickinson's Poem #378: "I saw no Way The Heavens were stitched / I felt the Columns close". Thus trapped, did Emily feel melancholic? Here's her answer: "and I alone / A Speck upon a Ball / Went out upon Circumference / Beyond the Dip of Bell" and she "touched the Universe" Let's celebrate Dante's courage and Emily's bravado! Scattered desires are not helping you to center your soul. Scattered desires link back to Tranströmer's poem "The Scattered Congregation". 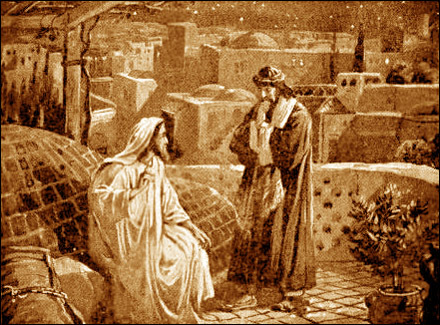 Nicodemus is lost precisely because his thoughts and desires are scattered and not focused or centered. M.C. Richards wrote a book Centering in Pottery, Poetry, and the Person (1964) that has become a classic in soul-work. Another classic is Zen in the Art of Archery where Eugen Herrigal talks about archery as a spiritual discipline of Zen. Hitting the center of the target is not an outward activity as such, but an inner centering of the soul to hit the bullseye. His Zen master showed this by hitting the bullseye target in the dark, then splitting the first arrow's shaft with a second shot, saying "It shot! Let's bow to the Buddha." Nicodemus wake up! The way is not out but in you! In his second class, Bly gave us a writing exercise using the first line from a Kabir poem: "Friend, wake up! Why do you go on sleeping?" Here's my poem "Friend Wake Up!" written that day (4-9-2008). Most of us are like Nicodemus living life in ignorance. That's why Christ said (John 8.32): "Know the Truth, and the Truth shall make you free!" and Buddha means "The Awakened One". Emily Dickinson knows this well in her Poem #383 (circa 1862): "Exhilaration is within / There can no Outer Wine / So royally intoxicate / as that diviner Brand." Nicodemus the sleepwalker cannot find the Address to that "diviner Brand" of Wine unless he seeks within himself and finds the Inner Treasure. 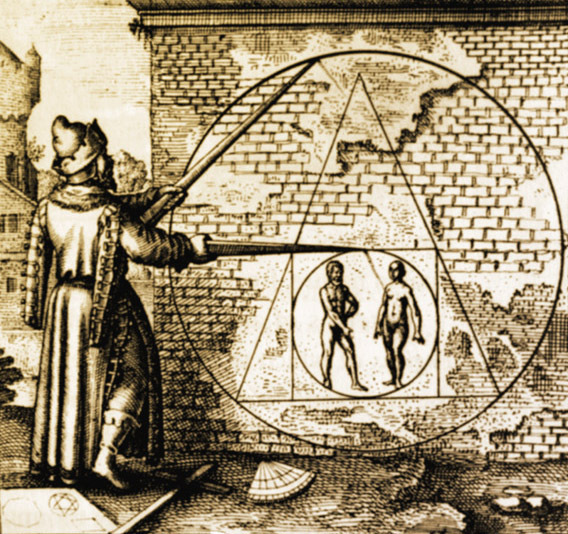 Michael Maier's Emblema XXI of Atalanta Fugiens (1618) shows a classical image of "Squaring the Circle" in finding the Philosopher's Stone in Alchemy. However, the real meaning is not the process of turning lead into gold, but to bring heaven (circle) to earth (square). This is soul-work and an inner transformation through meditation and contemplation. The Address may be π or 3.14 that reminds us of the circle's perfection that is the Soul as pointed out in those 3.14 references of scriptures and sacred literature. Once we realize that heaven is here on earth, there is no place to go for wherever we turn heaven is there and everywhere. Nicodemus is like the restless wave searching for the Kingdom of Water, not knowing that its very essence is water. Likewise we are all swimming in Pure Consciousness not knowing that this is our essential Buddha nature. Christ reminds us that "the Kingdom of Heaven is within you" (Luke 17.21). Plato's contemplation of the One will also leads us there. At the 27th step of π, God created the soul of the universe). (First 40 digits of π: 3.1415926535897932384626433832795028841971). The millionth digit of π = 1 followed by 3 (Trinity). It is interesting that the first digit of π is also 1 preceded by 3 (Trinity). That 1 is sandwiched between 3 and 4 in 3.14 is illuminating. Since 3 (Trinity) symbolizes Heaven and 4 (Quaternary) symbolizes Earth (four cardinal points of space and four seasons of time), the 1 is the Individual who brings Heaven to Earth. This is the Alchemical Work for the spiritual aspirant who finds the Philosopher's Stone to Enlightenment. 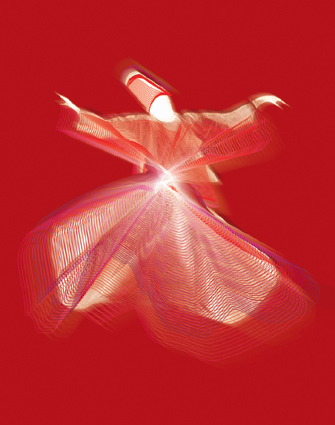 The Whirling Dervishes is a form of Sufi dancing founded by Rumi (1207-1273) where one spins around in a circle. The right palm uplifted to Heaven, the left palm downward to Earth, and the Dancer in the middle bringing blessings from Heaven to Earth (Sufi Dancer). The Jesus Round Dance in the 4th century played a similar role in centering dancers to the Transcendent.